A brief background of our company. Our 13th century premises in Milford Street have been used as a gunsmiths for more than seventy five years by Chamberlain, Jeffery’s of Guildford and since 1960 Greenfields of Salisbury. Firstly under the ownership of Kenneth W. Greenfield, and since 1997 by Alan Pike who started here in 1972 and trained as a gunsmith. 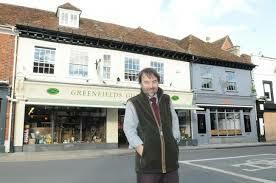 The Greenfield family had been involved in the London gun trade since the turn of the last century, but Ken Greenfield moved to Salisbury in 1960, buying the business from Jeffery’s. The shop became successful and earned a good reputation for selling fine quality used English guns. The shop currently has five full time members of staff including the owner Alan Pike who oversees most of the gun repairs in our in-house workshop. The shop stocks one of the largest selections of new & used guns in the country from such makers as Perazzi, Beretta, Browning, Miroku, Blaser, AYA, Lincoln, Sako, Mauser, Tikka, Howa & CZ to name but a few. A comprehensive selection of all shooting related accessories are also stocked from gun dog training equipment to gun cleaning & care. The vast selection of guns and shooting apparel are complimented by an even bigger selection of country clothing & footwear from such makers as Schoffel, Barbour, Laksen, Deer Hunter, Dubarry & Le Chameau. Due to the success of the shop we are delighted to announce that we are expanding into the premises next door formally known as 21B. The former nightclub was purchased in March 2016 with a view to expand the current shop floor, the extra space will more than double the shop floor area allowing us to display more products & guns then ever before. We hope to have the work completed by the start of the shooting season in 2017. Copyright © 2019 Greenfield Guns of Salisbury | Website design by Webkick Ltd.